ANNUAL RAINFALL: Varies from 18–29 in. (460–740 mm) in southern highlands to 12–14 in. (310–360 mm) in eastern lowlands to 4 in. (100 mm) in Danakil Depression. GOVERNMENT: Independence from Ethiopia, 1993. Transitional government since that time. National Assembly (legislature) elects the head of state. 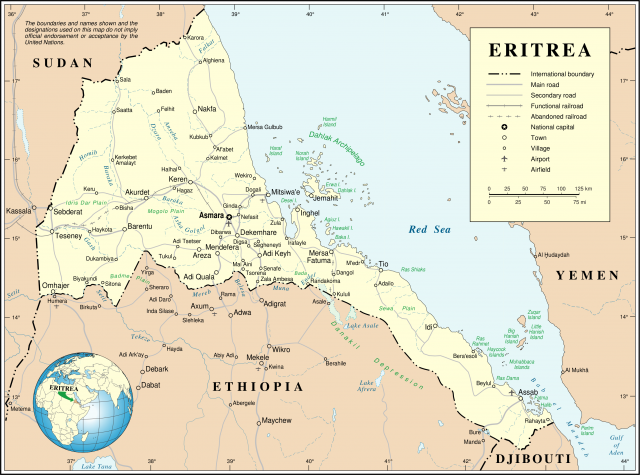 Eritrea, a small country located between SUDAN, ETHIOPIA, and the Red Sea, is the newest independent nation in Africa. Once one of Africa’s most promising regions, Eritrea suffered through decades of costly civil war. Since achieving independence in 1993, outbreaks of fighting with Ethiopia have hampered efforts to rebuild the nation. From about A.D. 300, Eritrea was part of ancient AKSUM and the Ethiopian kingdom. However, it enjoyed some autonomy until the 1500s, when it came under the control of the Ottoman Empire. Over the next centuries, Eritrea changed hands several times. Then in 1889 a treaty between Italy and Ethiopia declared the territory an Italian colony. Eritrea remained under Italian rule until 1941, when Italy lost its African colonies in World War II. Great Britain occupied the region for the next 11 years. In 1952 British occupation ended, and the United Nations combined Eritrea and Ethiopia in a federation. Although this arrangement supposedly provided for Eritrean self-rule, Ethiopia soon violated Eritrean rights. In 1962 Ethiopian Emperor HAILE SELASSIE made Eritrea a province of Ethiopia. The Eritrean Liberation Front (ELF), formed in 1961 by a small group of armed men, immediately began fighting for independence from Ethiopia. In the 1970s an offshoot of the ELF, the Eritrean Popular Liberation Front (EPLF), took over the battle for independence. In 1991 this new group formed a temporary Eritrean government, and in 1993 Eritrea became an independent nation. The EPLF changed its name to the People’s Front for Democracy and Justice (PFDJ) and became the nation’s only political party. Isayas Aferworki, former EPLF leader, was elected president in 1993 and again in 1997. More than 60,000 Eritreans died in the war for independence, and nearly 700,000 people fled the country. In 1998 thousands more lives were disrupted when a border dispute between Eritrea and Ethiopia led the two countries to war again. A peace treaty signed in December 2000 ended two years of some of the fiercest fighting in Africa. Most of Eritrea’s population is concentrated in the country’s northern, western, and eastern lowlands and in the Dahlak Archipelago, a system of islands off the coast. The country’s physical features, climate, and soils influence where people settle and how they earn their living. Generally high temperatures, low rainfall, and poor soils limit agriculture to the few areas where crops can be irrigated by rivers. Irrigation enables farmers to grow cotton as a cash crop in the northwestern plains. Some agriculture is also possible on Eritrea’s central plateau where the climate is relatively mild. However, the plateau region has a history of famines because of crop failure, crop destruction by locusts and other pests, and the death of plow oxen from disease and drought. Nomadic herders live in the western foothills and plains bordering Sudan. Since independence, Eritrea has tried to improve its economy by modernizing agriculture, expanding small-scale manufacturing, and increasing mineral exploration. Through its ports at Massawa and Assab, Eritrea provides Ethiopia with its only access to the Red Sea and to important international trade.